Indy is packed with holiday fun, with plenty of festivities to fill your calendar all month long. If you are itching for an adventure a bit farther from home, however, there are a number of holiday getaways just a short drive away. Here are a few of our favorites. America’s Christmas Hometown is just a short drive away in the quaint town of Santa Claus, Indiana. While it is a fun spot to visit year-round, it truly comes to life this time of year. 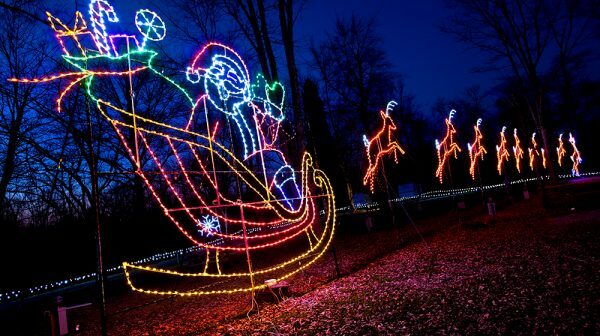 Write a letter to Santa at the Santa Claus Museum & Village (and receive a reply before Christmas), visit with Santa at the Santa Claus Christmas Store, stock up on nostalgic candy from days gone by at Santa’s Candy Castle and drive through the 1.2-mile festive light display at Lake Rudolph Campground & RV Resort. Special programming is held throughout the holiday season. Learn more at https://santaclausind.org/10-holiday-activities. Historic Clifton Mill is beautiful to behold on any given day. During their legendary light display, it is absolutely breathtaking. An extraordinary light display consisting of 3.5 million lights illuminates the mill, the gorge, the riverbanks, trees and bridges. Every night until Dec. 23, little ones can peek into Santa’s workshop to see a live Santa at work. Every 15 minutes, watch him check his list and go up the chimney to load his sleigh. Other highlights include a musical covered-bridge light show every hour on the hour and an outdoor miniature village complete with replica train station, moving light parade, diner and drive-in movie. The light display runs through Jan. 1. Visit https://cliftonmill.com/christmas to learn more about this magical experience. Whether you are looking to get away for a day or an entire weekend, these holiday-themed getaways will help your family make the most of the holiday season this year. Happy travels!